Your safe is all about keeping your belongings protected. It is crucial to get the best safe technology available to ensure you won’t have any problems, from break-ins to young hands. For your next safe, consider investing in a dual lock gun safe with the EMP locking system. This will give you more peace of mind than anything else. WHAT IS EMP SAFE LOCK? Electronic-mechanical protection is the best way to keep your electrical lock protected. The biggest threat to your lock comes from an electromagnetic pulse. This can be caused by many different things, most dramatically nuclear detonation, but in some situations, smaller things can cause problems such as floods and other natural disasters. To prevent these events from disabling the lock on your safe, consider investing in the EMP technology. This will prevent you from being crippled by the situation. If this should happen, your safe will have a second EMP lock that will allow you to manually use your combination to unlock the safe. WHY CHOOSE SAFES WITH EMP RESISTANCE? Homeowners know that in emergency situations, you may need access to your safe in a short amount of time. This means investing in the fastest and most reliable lock available on the market. Before the emergence of EMP technology, homeowners were taking a risk with a fast and convenient electronic lock. There was always a chance of an electromagnetic pulse making it impossible to enter the safe. With this technology, a mechanical lock can be used in the worst emergency situations. You won’t have to feel nervous that your safe won’t work when you want it to. Instead feel confident that if one mechanism fails, you have a guaranteed backup ready for you. The dual-access EMP locking system is the easiest way to feel confident that in any situation you will be ready; whether that includes an intruder entering your home unexpectedly or natural disaster calls for quick evacuation. Not only will you get your items as quick as possible, but, in the case of natural disaster, should these weather conditions ever damage the electronic lock, you will have a second entrance into your safe. Don’t be caught off guard when it comes to the protection of your belongings. Invest in the best technology, and the best safe. 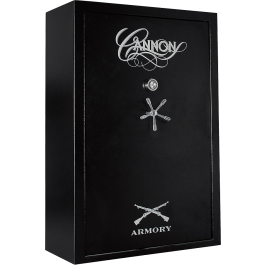 At Cannon Safe, we offer EMP technology with the Cannon 1965 Premium Collection. Decide which safe best fits your situation and being protecting your belongings and family from harm. Hey Mike, Thank you for inquiring about the EMP lock. Unfortunately at the moment Cannon does not sell locks separately that can be retrofitted on different safes. Do you offer that now? The only reason I have not purchased a Cannon is because your EMP lock is ONLY on your HUGE safe but it won’t fit in my space. Why would you only install them on your large safe? Does Cannon not understand not all people need a huge safe but still want the EMP lock? Please make this an upgrade for other gun safes and charge an extra few hundred I bet you will sell more…..looks like you have 3 people here :). We will definitely take all of the feedback into consideration. Cannon is all about continual improvement! You once offered the locks on less expensive models. I have one on my Cannon CA33 from 3 or 4 years ago. I wanted another one like that, but you don’t seem to offer them any longer. I would love to have an amp lock but need a smaller more economical safe. Please offer more models with the emp lock, you will sell so many! I too recently inquired about getting an emp lock on a smaller safe and was only told that it is offered on the larger safe. Makes no sense, you’re losing a good bit of customers because of this decision. I have since shopped elsewhere and purchased from another supplier. Too bad because I really would have preferred to buy a cannon safe. Unfortunate. I too own a smaller 24-gun safe with digital lock, and was hoping for a retrofit EMP lock. I understand the mechanical limitations, but am not willing to maintain the status-quo, and don’t have the room or need for a larger safe. I guess I’ll sell my existing unit and buy elsewhere.